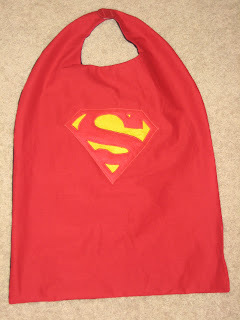 A Superman/Batman combo cape for my cousin's son, Jack. 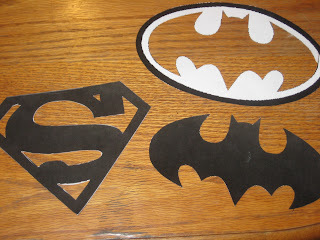 Start with Superman and Batman symbols printed on cardstock. You can find several nice images of these online. 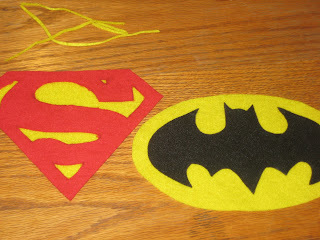 Cut out two Superman shapes, one red felt and one yellow felt. 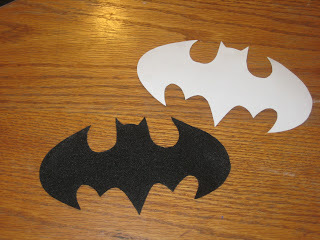 Also one oval for the Batman shapes. I just traced around my printed images using a pencil and then cut. 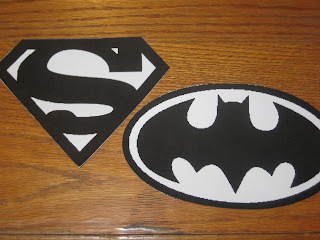 Next, cut out the negative space of the Superman symbol and the bat out of the Batman symbol. I used a craft knife. Take your time so it's nice and clean cut. 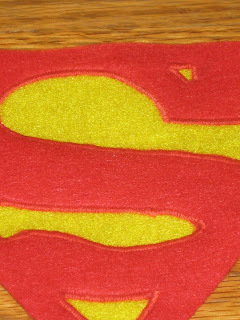 Trace and cut out the "S" on the red felt for the Superman symbol using a craft knife. Once again, take your time. This is the worst part of the whole process right here....so not too bad. Sew a zigzag stitch using red thread for your "S" and black thread for your bat. I did a pretty tight zigzag, but you could do it a little looser if you wish. Your symbols are done! Now onto the cape itself. 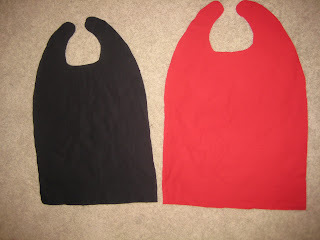 I am making a copy of a cape I already have, so I just traced around the existing cape, and cut one red and one black. 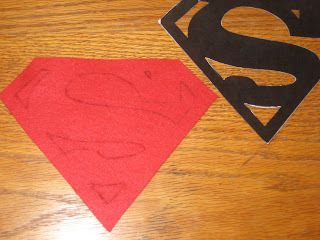 The dimensions of my cape are 26" long and 17" wide. Make sure you wash, dry and iron your fabric first to avoid shrinking! 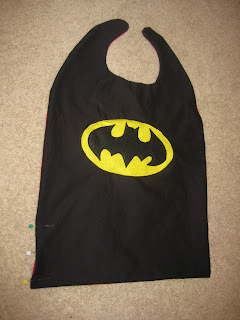 Your cape is inside out when you finish sewing. Turn it right side in (surprisingly easy to do) and pin your gap closed. 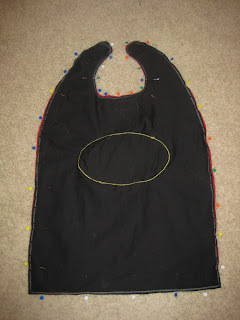 (See above) Sew your gap closed with a straight stitch. I sewed this step with my black fabric facing up, and therefore, used black for my top thread and red for my bobbin thread. 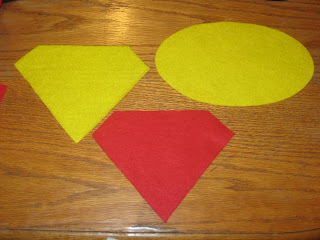 Sew one velcro piece to each end, one on a red side and one on a black side. You could also use a snap or a button if you wish. Iron your now completed cape! Press the edges for a sharp, clean look. Brittney, you are soooo STINKEN creative!!!!!!!!!!!!!!!!!!!!!!!!!!!! I seriously cannot get ENOUGH!!! I want to go to Joanne's today and get the faberic. 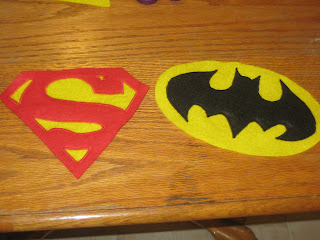 I think Ill have to make two; batman/superman and batman/storm...val is a fan of storm. Have I told you? I love your blog! Wow - really amazing Britt - I am impressed!!! Heather, send me a pic when you're done! Rowan would look great in one of these! Brittney I havent made anything yet, someday though, and when I do I'll send pictures for sure. I have one question for you: the zig-zagging you use is very close together, I like that. Do you have to change a setting on your sewing machine to get it that close? 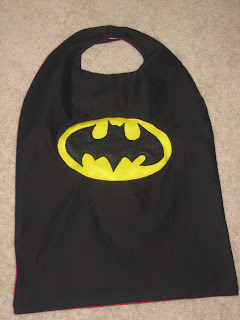 For instance, the zig zagging in the post you posted today (letter B onsies) wasnt as close as the superhero zig zagging. If Im not making any sense just ask. by the way, Im going to use your idea on the letters, I love it! Who knows, my husband might just have to show up to work with his initial or a huge sun on the back of his suit coat. My sewing machine has a wide range for the width and density of my zigzag. I just adjust it to whatever I'm feeling at the time. I did a tighter zigzag on the cape because it was thicker material (felt) and I didn't use any Wonder Under to help secure it either. Experiment with some scrap material on your width and density of zigzag and see what looks and feels best for you.